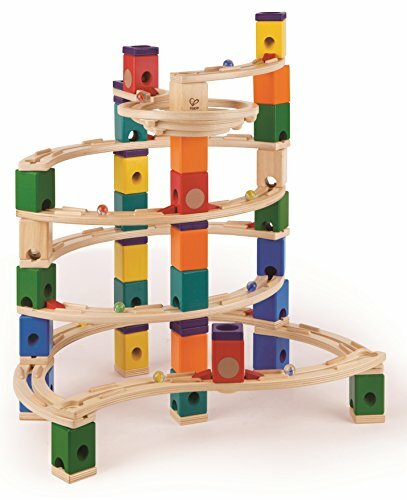 What is a marble run? It has eight solid bases including three large ones to ensure that the structure is stable enough. The solid pieces stick together without any problem but still make it easy for 4-year olds to play with them. 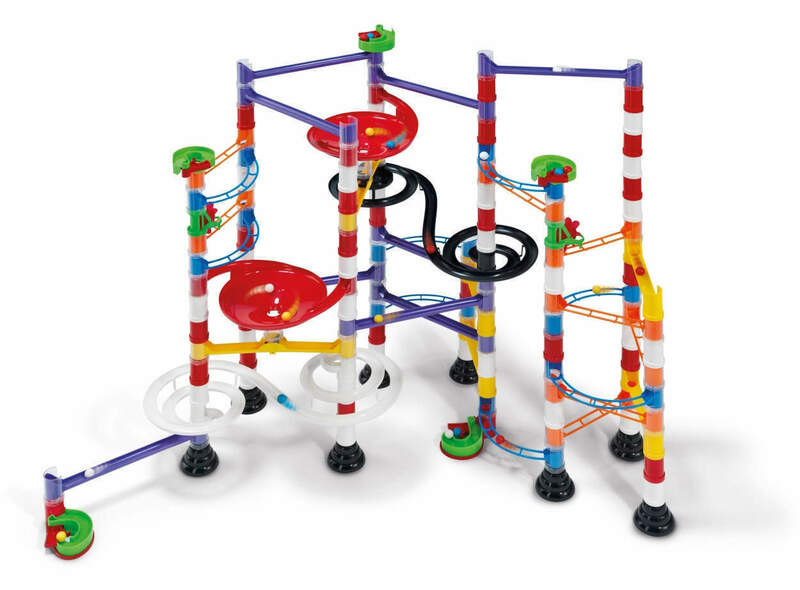 Kids will also love the see-through marble runs because they can see all the action when the marbles go down the set. The colours are bold and vibrant which makes it super fun to look at and watch. There’s plenty of possibilities, and your child can build a wide variety of sets ranging from simple to complex. The joints are snug, and the pieces stay together in place. It’s well-made and will keep your child busy for hours. It’s not opaque so you can see all the marbles moving along the track. The bases are sturdier than other brands – can hold plenty of marbles without breaking apart or crumbling down. It has plenty of pieces and structures to experiment with – useful for harnessing creativity and imagination. The weight needs to stay well-balanced, so it won’t come apart when your child is building complicated structures. Instructions aren’t complete which can be frustrating to some kids. It’s a bit hard to set at first. With high-quality plastic pieces in bold and vibrant colours, this is something that will capture any kid’s attention. This 120-pc set lets the marbles glide smoothly along the structure design. The unlimited configurations will help your little one understand the concept of engineering and design. And it’s not something they will easily find tiring. All the pieces fit together well. It’s easier for your child to stick them and pull them apart. It’s sturdy and has fun parts and gears to make them appreciate the movement of the marbles. It needs careful thinking to keep the base steady and stable – consider it a fun challenge for your kid. It’s an excellent stimulating activity to enhance their problem-solving skills. There are no sample models which would’ve been amazing for those first-time users with little idea about the set’s potential. If there are photos provided, they can follow it and might easily understand how it works. A better guide or instruction manual is a huge plus. It comes in a brown cardboard box which isn’t the best way to store it. It’s a bit hard trying to follow the marbles because of the colours. 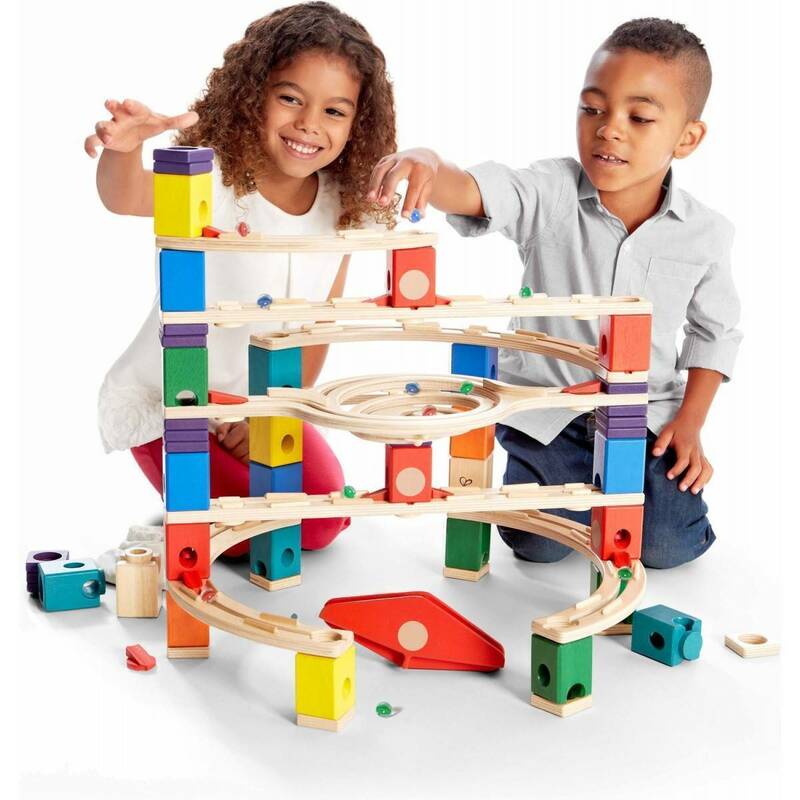 This wooden set contains pieces which are non-toxic and safe for children to play. Aside from the 137 pieces, the package also includes a drawstring pouch for storage of the items. That makes it easier to carry it wherever you go. The colours and finishes also look beautiful. If you’re not a fan of plastic toys, you will like this wooden set. It includes interesting and fun pieces like curved ramps, straight rails, accelerators and connecting blocks. It’s a good quality toy, and it doesn’t feel cheap or flimsy. It won’t break after a few months of use. It’s well-made and sturdy especially the wood. It’s also stable and doesn’t fall apart quickly. The instructions that come with the package are clear. It’s easy for any 4-year old and up to follow. It serves as an excellent guide to give them an idea what the pieces are capable of - they'd be amazed at the structures they can build. It also helps to inspire them in creating designs of their own. Sometimes, they might not lock in place that quickly. If your child doesn’t ‘lock’ them, the whole structure might break apart and crumble down. If it falls, just encourage your kid to rebuild. With a total of 68 pieces (including funnels, ramps and flippers), you’re guaranteed hours of fun. The number of designs and structures your little one can make is limitless. The company assures that the toy is phthalates-free and won’t harm your child with the materials used. The plastic is high quality, durable and sturdy. Little boys are known for being rough in handling their toys. This set can take all that. They can step on it and still won’t break it (I wouldn’t recommend doing it on purpose, though). It’s easy to put together and has enough pieces to keep kids entertained for long periods of time. It’s plentiful that they can choose and decide a variety of runs. It develops critical and logical thinking since it allows them to analyse and consider which route and structure is the best. There’s always a new tower to create. Kids get endless possibilities, and they can engineer it any way they want. Some parts do not stay well together which can be frustrating to kids. It doesn’t come with an instruction manual or guide which makes it difficult for younger kids (and first-time users at that) to play. Whoever thought to use ‘marbulous’ seriously deserves a raise or promotion. That’s genius! Each set contains 48 pieces and 16 marbles in total. Because it’s transparent, kids can easily see and track where the marble is and watch it travel through twists and turns and lastly, go down. One set has enough pieces to inspire the children to create and build various towers and structures – experimenting with the design along the way. The colored but clear plastic is durable and high quality. It doesn’t break easily. The diagrams included in the package are a huge bonus. It’s a great way to ‘guide’ your child on how to make designs but still allow them the freedom and independence to follow what they want. Sometimes they need your help but other times, just let them explore and figure out on their own. The marbles glide down the ramps without any problem. The base pieces ‘catch’ the marbles which prevents any of them from rolling all over the place. It’s easy to put together since they snap easily. The ‘tunnels’ can fit any standard size marble. It has fewer pieces than the other sets listed here. It’s one of the greatest STEM (science, technology, engineering and math) activities for your child. Whether it’s inside the classroom or at home, you’re sure it has plenty of advantages for both mental and intellectual development. It is a creative kind of play that will make them think while still having fun. Depending on the complexity of the structure, your kids will stay busy and occupied for hours. 1. It enables them to develop their logical and critical thinking. At this age, they’ve graduated from basic puzzle activities which is why you also need to step up your game. 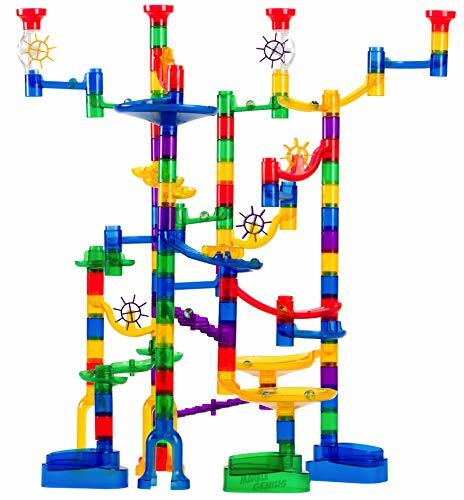 There’s a wide variety of marble run structure ranging from simple to complex. 2. It further develops creativity. When looking for toys or activities, this is one of the valuable skills we aim to develop in children. Creativity boosts how they analyse and solve problems. And because it makes them feel great while participating, it also enhances their self-esteem and confidence. All of these perks are beneficial in the long run and even more so as the kids grow up and start pursuing a career. 3. It keeps kids active and engaged. Keep in mind that when they’re engaged in the activity, they can easily remember all the things they learned. Plus, they’re having a grand time, so they will be occupied but still have fun while they’re at it. They’re not just looking on the sidelines but they’re participating and being part of the whole activity. Kids love being involved no matter what it is. 4. It enhances the ability to innovate. Innovators are the future of the world. If you need a solid proof, look no further than Steve Jobs. He has changed the way we listen to music or use our phones. And it all begins with simple ‘play’ like marble runs. It accomplishes so much to help in the development ﻿﻿of your kid. It’s more complicated and exciting than other activities. You’re practically moulding your child into someone with impressive critical thinking and valuable skills. 5. It harnesses their problem-solving skills. Every single day, there’s something new from technology and where do you think it starts? Your child may be four years old today, but tomorrow, they could hold the answer to various problems that plague our world. 6. It teaches them patience. Of course, it all depends on the size and complexity. Building alone might take hours but it never gets uninteresting. It’s not something you can assemble in seconds which, in turn, will teach your child the value of delayed gratification and yes, learn to wait and be patient. Besides, when they’re patient enough, they can follow the directions carefully. There are things they have to do with precision and accuracy and this is one of them. You can't rush stuff like this. There are so many STEM activities which can help your kids, but with marble runs, the possibilities are endless. Sure, there are ‘educational’ videos and apps which may also contribute to stimulating your child’s critical thinking skills, but nothing beats something like this. The mechanics on how all the stuff moves is challenging and also piques the interest and curiosity of the little ones’ minds. There are various aspects and principles to consider. On the outside, it looks like a typical plaything. But when you look closer, it’s something your 4-year-old can benefit from enormously. Another thing about marble runs is its flexibility. From wood and train tracks to pegboards and pipe insulations, it’s all about creativity and innovation. And when they’re done, your child will have a sense of accomplishment – like they just achieved something big. It will make them feel good when they see the product of their patience and hard work. 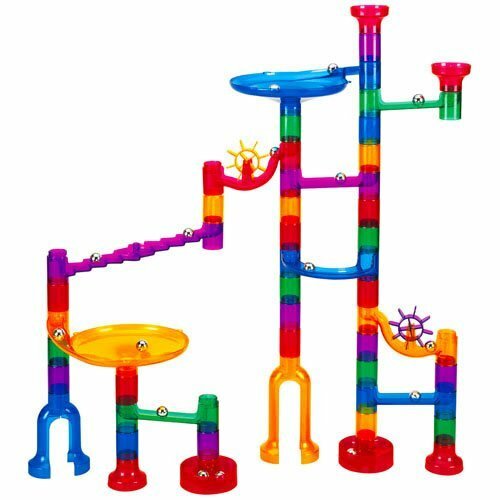 However, just like when choosing toys, the type of marble run should be age-appropriate. You wouldn’t want something so advanced your child will fail to construct it. At the end of the day, it’s supposed to be a fun game that will introduce them to the concept of physics and design. 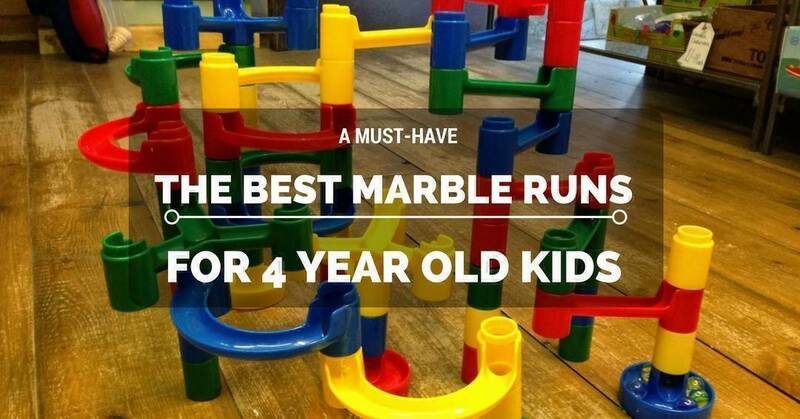 The last thing you need is a marble run too difficult for a 4-year-old. They will only end up frustrated that they’re unable to do it right. 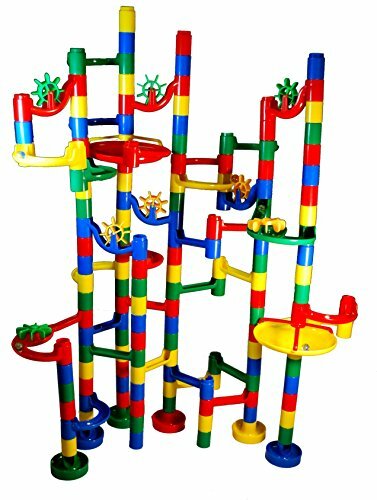 Not all marble runs have the same complexity which is why I scoured around and looked for the best fit for your kid. Make it a pleasant time for them. 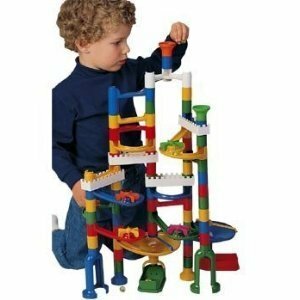 Marble runs are stimulating toys that have great educational value. It’s one of those playthings that every child needs to have – it’s fun and yet, it enhances various skills like critical thinking, analysis and problem-solving. Children can benefit from it in the long run, even more so if they grown up to be engineers. They may not perfect it that quickly but with each structure they build, they learn and they grow. And for all the products listed here, my ultimate choice is the Marble Genius Super Set. You can do away without the instructions since you can find everything on the internet. But looking at the bigger picture, it’s the best option.